Aberdeenshire Council is facing calls to apologise for supporting the development of Donald Trump’s golf course in Menie, which failed to bring the investment and jobs promised while causing irreversible environmental damage. In a petition launched on the campaigning site 38 Degrees, Aberdeenshire resident, Clive Smith, asked the council to say sorry and learn from the “sad episode” more than a decade on. Councillors are set to debate Smith’s petition at the next council meeting on 25 April. 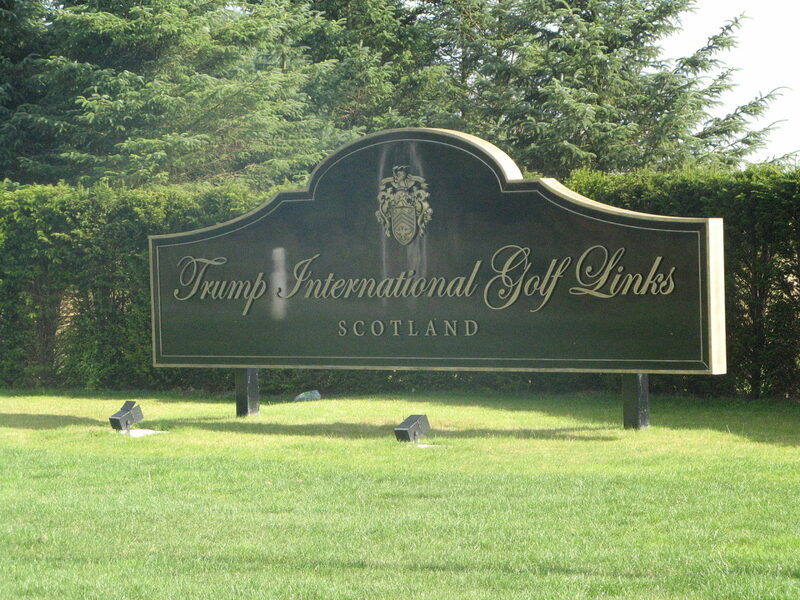 This will coincide with a decision on whether to allow The Trump Organisation to build 550 up-market homes near Trump International Golf Links on the north east coast. Planning permission for the golf course was backed by council officials but rejected by the local authority’s Infrastructure Services Committee in 2007. The project, which promised £1 billion of investment and the creation of 6000 jobs, went ahead after an intervention by Alex Salmond’s Scottish Government, who considered it to be an issue of national importance. The BBC reported in July 2018 that The Trump Organization said it had spent around £100 million on the project – just 10 per cent of the £1 billion promised. It said that 500 construction workers and 150 others had been employed, including part-time and seasonal staff. One major objection to the construction of the golf course was that it endangered rare sand dunes. The Ferret reported in 2017 that the dunes are now likely to be stripped of their status as a Site of Special Scientific Interest because of the “loss and damage” caused by the Trump development. In his petition, Smith argued that the council “supported the destruction of an irreplaceable nature conservation site on the basis of unlikely and exaggerated promises of jobs and investment which have never materialised”. The council then “refused to rule out using its powers of compulsory purchase to obtain residents’ homes on behalf of Mr Trump, causing great distress”, he said. An Aberdeenshire Council spokesperson confirmed that they had received Smith’s petition and that it would be considered at the council meeting on 25 April. Scottish Green councillor, Martin Ford, who opposed the golf course when he was chairman of the council’s Infrastructure Services Committee, said that the region had suffered the “downsides” of Trump’s development, including the “environmental damage” but without the wealth of benefits promised. BBC Scotland reported in March that 2918 of 2921 representations – of which one letter contained a petition with 18,722 names – opposed the Trump Organisation’s new housing plans, while just three were in support. However, a spokeswoman for the organisation said she predicted a “positive outcome”. Campaign group, Tripping Up Trump, has launched a petition to oppose the development, which argues that the proposed homes “will be unaffordable to anyone except the rich, featuring villas planned to sell for over £1 million”. The group’s petition, which has almost 20,000 signatures, adds: “Trump cannot be trusted to deliver on his promises for this resort, and this new development will further damage the beautiful North Sea coastline whilst lining his own pockets.